Benin City, March 13, 2019 As you are aware, Nigeria joined Open Government Partnership as the 70th member country in July 2016 and since then, Civil Society Organisations, MDAs, Organised Private Sector, and Professional bodies have collaborated and continued to advance the principles of OGP. 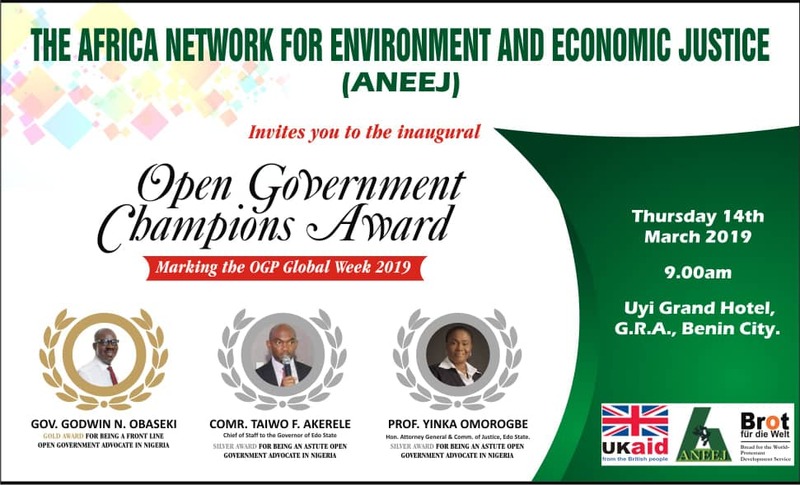 The Africa Network for Environment and Economic Justice, ANEEJ has initiated the Open Government Champions award to recognise some personalities who have contributed to promoting transparency, accountability and open government in Edo State. The inaugural award ceremony will be conferred on three deserving personalities through whose effort Edo State government became the first in the South-South to join the Open Government Partnership (OGP). In a statement made available to newsmen, ANEEJ Executive Director, Rev. David Ugolor noted that since Edo State government has signed on to the global initiative, ANEEJ decided to join the conversation and add her perspective and ideas to events marking 2019 OGP week around the World by presenting the “Open Government Champions Award” to Edo State Governor, Godwin Obaseki, Comrade Taiwo Akerele, Chief of Staff to the Governor and Prof. Yinka Omorogbe, Attorney General and Commissioner for Justice, Edo State. Subsequently, ANEEJ will identify awardees from different parts of the country using specific criteria, to champion the ideals of a transparent, accountable and open government and this will be done in consultation with stakeholders drawn from government, private sector and civil society. The Open Government Champion Award platform will provide opportunities for civil society and government to co-create policies, programmes and activities that will strengthen governance and share best practices on Open Government reform across the Country. There will be annual Open Government Champion Network Conference to sustain the exchange of ideas and the sharing of lessons on Open Government initiative in Nigeria, Ugolor said.